Steve Thweatt retired as the Vice Chancellor for Administration at the University of Colorado at Boulder in 2015 after 18 years of service as the campus architect and Assistant VC of Facilities Management, and has previous design and architecture experience at Emory University and Duke University. Steve has been a faculty member of the APPA Institute since 1998 and continues to teach in the Planning, Design and Construction track. He is also a member of the NCARB, APPA, RMA, SCUP and past President and Fellow of the Association of University Architects. Steve also has over 20 years of combined experience as an adjunct faculty member at the U of Colorado, The U of Denver and North Carolina State U. Value management is a concept that embraces the design of facilities while balancing appropriate but sometimes competing program, quality, performance, and cost requirements. For an institution to realize the best overall value for its capital investment in new or renovated facilities, the total cost of ownership must be considered continuously throughout the design process. Making good decisions related to true value during design does not happen without a focused effort; but rather is the result of procedures introduced in the process that ensure its consideration and implementation. This chapter will cover (1) designing for maintainability, (2) the evaluation of designs using life-cycle cost techniques and value management review processes, (3) the use of organized project design reviews, and (4) the development of a facilities maintenance impact statement. Although many needs compete for inclusion in all capital projects, a long-term view of capital assets represents a continuing investment in education facilities. Without the utilization of a value management process, the long-term view is often neglected and those assets are jeopardized. In addition to facilities, the design process, along with the facilities themselves, has continued to increase in complexity, with many factors influencing that process. Coupled with these complexities is an ever-increasing awareness of the built environment and the need to conserve all natural resources. Sustainability has become a focus for many areas of facility development, including the design process. The continuous development of new products and the ability to store and retrieve data also give the designer more alternatives and information to consider for design solutions. 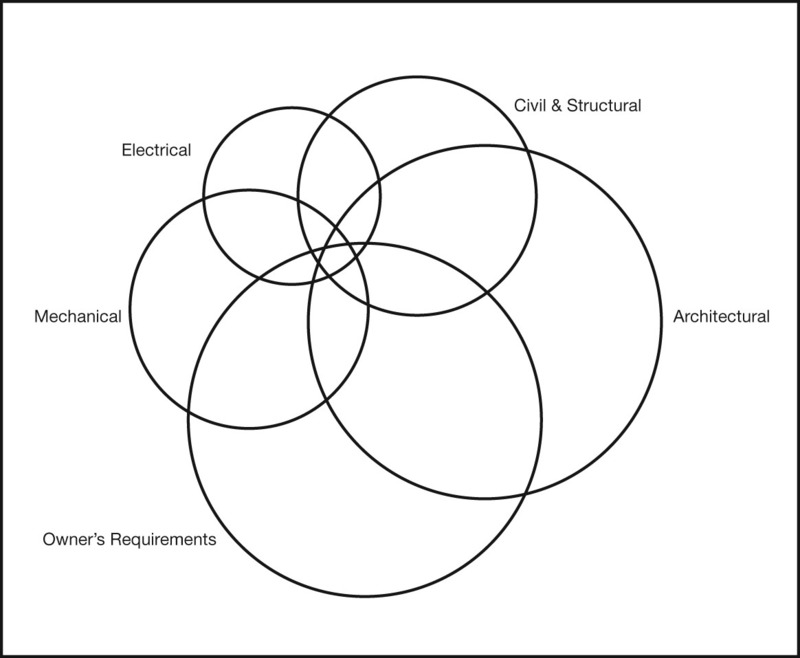 The overlapping of these often-competing needs with the various professional disciplines involved in the ever-expanding design team requires even greater coordination and evaluation during the entire design process. Figure 1 illustrates the fact that the owner's requirements and the architectural discipline have the greatest impact on the cost. The figure also shows the significance of early decision making on a project's cost and how each discipline overlaps the others. Significant savings typically occur earlier in the process and in the overlapping areas. The owner's requirements may not fit the budget, or if one discipline dominates the design input, then the design will be out of balance and may not provide an optimal solution. Note: Figure based on typical office building. Impact will vary by type of structure. Source: Dell'Isola, Alphonse J. Value Engineering in the Construction Industry, third edition. New York: Van Nostrand Reinhold, 1988. Management is not something that occurs late in the design process when budget issues begin to appear; rather it is something that must be an integral part of the process from the beginning. To that end, there is no more important time for decision making on a project than the beginning. Decisions that are made in the early stages of a project have the greatest impact on the outcome of a project and must be carefully considered. Figure 2 appropriately illustrates this with the 90/10 rule, which states that “decisions made during the first 10 percent of a project’s effort determine 90 percent of a project’s outcome, particularly as it relates to cost and schedule.”? Both life-cycle cost and value management methodologies have proven to be invaluable tools for making cost-effective decisions throughout the entire design process. Owners increasingly are concerned about the continuing costs of ownership as energy and labor costs continue to escalate. The use of new materials and systems in building designs often results in new maintenance problems for the facilities organization. Therefore, a statement of maintenance impact is useful in the complex economic evaluation of the building project. Designers are faced with an array of complex decisions during the process of designing a building. They must deal with issues ranging from space and program requirements, functional adjacencies and relationships, site context, budget constraints, schedules, regulations, material and systems selections, and aesthetics and then must put it all together into a satisfactorily executed project. The final solution may satisfy some of the requirements of a project, but it rarely satisfies all of them, primarily because of budgetary constraints. Programmatic needs may be met and initial costs may be contained within the budget, but the total cost of ownership is often neglected in the process. In designing facilities for maintainability, the owner should prepare a maintenance profile, including the budgets for staffing, energy, building systems upkeep, and replacement costs. As described in the definitions, the total cost of ownership (TCO) is the dollar per square foot value associated with a facility. It is a calculation of all facilities-specific costs (not including furnishings or nonfacility-specific equipment) divided by the estimated life span of the building (30 or 50 years), and then divided by the total gross area. Over the life of a building, the original capital costs and the maintenance and operational costs are almost equal, but when recapitalization costs are added to the TCO, the final cost of owning and operating a facility often exceeds its initial cost. This comparison is articulated in a recent CFaR2 study titled "Buildings, the Gifts That Keep on Taking." When the building is occupied by a high-energy user, such as a research laboratory, building systems should be designed for minimum energy demand. If the occupancy demands flexibility, then systems should be selected for minimum energy use coupled with minimum cost to change the functional use in the future. Systems should be designed respecting the class of operating personnel and philosophy of the owner. Today’s sophisticated mechanical systems can produce some highly efficient building systems, yet without the ability to properly maintain them, their value and effectiveness is diminished. If funds are difficult to obtain for replacement costs and regular maintenance, then materials and systems must be selected with a focus for long life and minimum regular care. This means that balance must be achieved between initial costs and continuing maintenance costs. To design an economically balanced project, the designer must make decisions early in the design process to be the most cost-effective. Value management and life-cycle cost methodologies will assist the designer and owner in making cost-effective decisions for maintainability as well as design quality. Value management is a creative, function-oriented, organized approach to optimizing the total cost and performance of a facility or service. Value management is rooted in the more traditional value engineering approach to project budgeting and review, yet value engineering has been used more as a cost-cutting tool for projects that are in financial trouble than as a good decision-making tool (its intended use). Value engineering should be performed by the entire project team supplemented by specialty consultants not associated with the design team. The practice draws on the individual viewpoints, experience, and knowledge of its members. The review should be led by a certified value specialist and follow a "job plan" of specific steps: information gathering, functional analysis, speculation (creativity), analysis (judging), development, and presentation. Value engineering is a systematic process relying on the use of analysis concepts and techniques that identify and analyze the function of the project components and systems. Creative techniques, especially brainstorming, are used to identify and consider various alternatives. The value management process embraces value engineering principles to ensure that the appropriate people are involved in the evaluation and decision-making process. As explained with the 90 /10 rule, value engineering is most effective during the early stages of design, because the ideas are still conceptual, and the owner and the designer can be flexible with their decisions without incurring delays in the project schedule. Value engineering tools and methodology are appropriate for any project. They produce optimal results in layout, structural bay sizing, floor-to-floor height, exterior closure, finishes, mechanical and electrical systems, day lighting, furnishings, net-to-gross floor areas, systems integration, roofing systems, energy conservation, and constructability. Value engineering techniques are also useful in deciding whether to renovate, expand, replace, substitute, or eliminate present facilities. 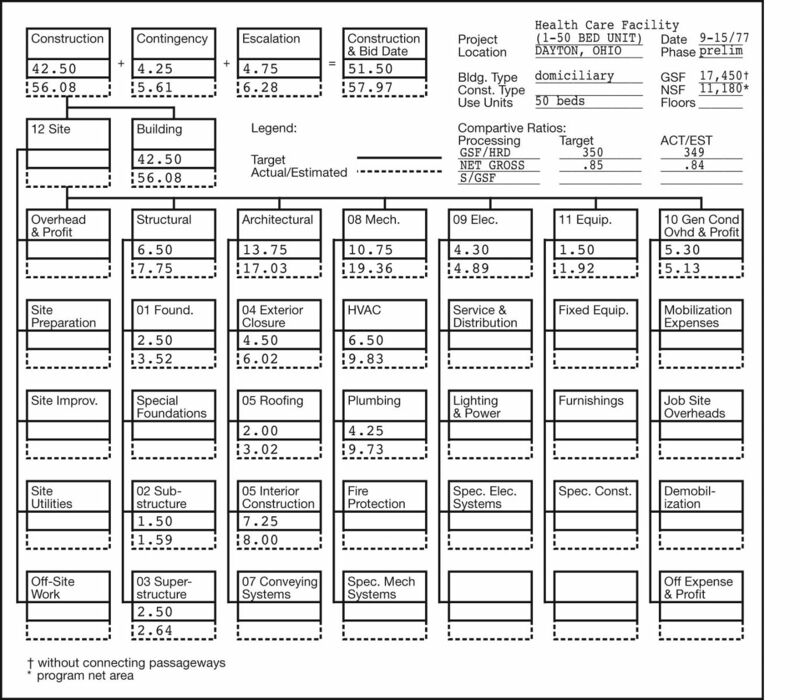 Project cost information is organized in a cost model following the UniFormat system, as illustrated in Figure 3. 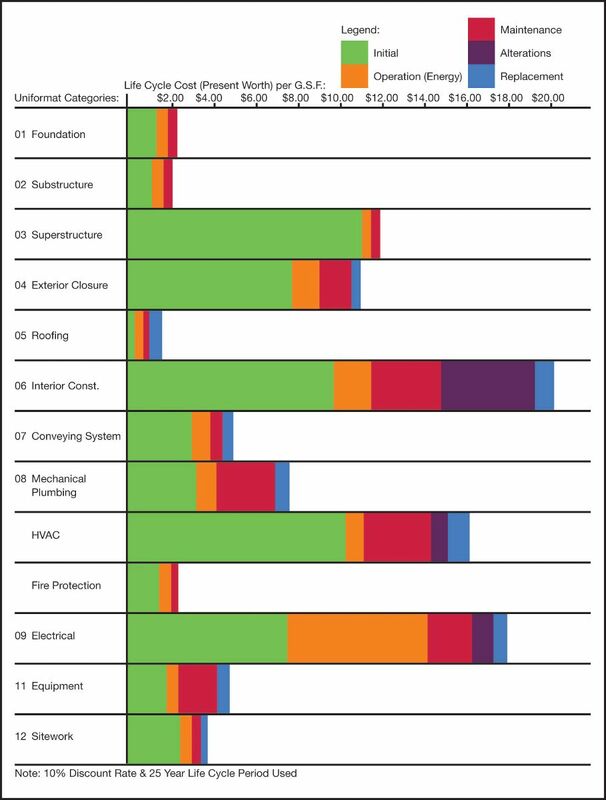 The cost model indicates that architectural and mechanical areas offer the best potential for savings and should be the subject of in-depth studies. Source: Dell'Isola, Alphonse J., and Stephen J. Kirk. Life Cycle Costing for Design Professionals. New York: McGraw-Hill, 1981. 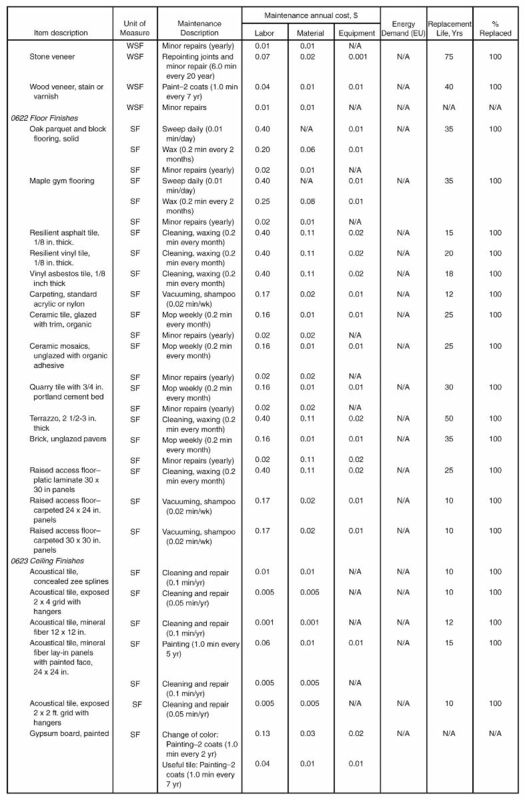 Evaluation of the alternatives during the analytical phase of the value engineering job plan is accomplished using the weighted evaluation form illustrated in figure 4. Each criterion is compared against the others and evaluated as to which has preference and to what degree. This results in weighted criteria against which each alternative is judged. The alternative receiving the highest score is the preferred solution at this time in the value engineering process. Using value engineering, design professionals identify required functions, develop alternatives, and select the most long-term cost-effective solution, thereby better satisfying overall project requirements and achieving functional performance, while ensuring that owners receive the optimal return on investment. Value engineering, when applied correctly, results in optimal cost and design excellence. Value engineering invariably produces savings that greatly exceed the cost of the process itself. The ratios vary according to the job and the areas of work, but savings in a ratio of 2:1 are routine, and 20:1 is not uncommon. As a rule of thumb, value engineering should identify savings of 5 to l0 percent of total project costs, while the typical cost of value engineering is 0.2 to 0.5 percent of the construction cost. Value management takes the value engineering process and ensures that the right people are involved in the entire process. For example, studies should be conducted through the leadership of a certified value specialist with extensive experience in this type of work. A key to developing meaningful proposals is to use an experienced multidisciplinary team that was not involved in the original decisions to supplement the project team efforts. This approach brings to the process an objective design appraisal that can significantly improve many traditional designs. The primary business of some consulting firms is to perform value engineering studies in addition to conducting value engineering training. If the institution is actively involved in projects of significant size, or in significant numbers of projects, it may be desirable to have a value engineering officer on staff. As an alternative to a permanent staff person, however, open-ended contracts with a consulting firm are used for an established value engineering program. It is equally important to have the facilities staff, project manager, design team, prospective occupant, and other affected stakeholders represented in the value management process. Value engineering is only one of the tools available in the value management process and should not be used to simply reduce costs. Although it usually identifies opportunities for savings, it should be performed as a part of the overall value management strategy to ensure the best value by identifying unnecessary costs or wasteful expenditures. As value engineering identifies alternatives for better value, the methodology of analysis includes economic assessment, considering all the significant costs of ownership over an economic life expressed in equivalent dollars. Significant costs of ownership include initial costs, financing, operational (energy), maintenance, alterations and replacement, tax elements, and salvage value. To assess the economic value of the alternatives, all costs are brought back to a baseline to develop equivalent costs, and the project life and discount rate (borrowing rate) are established using proper economic procedures. To reduce time and complexity in using life-cycle cost methodology, the elements that will be the same in any of the options are identified and removed or fixed during the analysis. The significant costs associated with each alternative are isolated and grouped by year, or time spans, appropriate for the user. All costs are converted to current dollars by present-worth calculations, using a reasonable discount factor. This is done because a cost incurred in the twentieth year or the fifth year is not the same present value as one incurred in the first year. Decisions made early in a project have the greatest impact on the cost of construction and conversely are the most important in terms of savings potential (the 90/10 rule). It is equally important to focus on the appropriate level of decision making to ensure that the greatest impact is realized. For example, the selection of a major building system type, such as heating, ventilation, and air conditioning (HVAC), is more important than selecting the specific manufacturer of the equipment. A decision made late in the design process with regard to systems type has increasing cost implications, and savings naturally will be reduced. The major impact of life-cycle cost occurs in concept, schematics, and, to a lesser degree, design development. Life-cycle cost can also be used during the predesign phase to help determine project feasibility. It has been shown that $1 saved from operating costs through better planning or design is equivalent to a $10 to $12 reduction in construction costs. It is often easier to take $1 out of operating costs than construction, and considering that the savings potentially can be multiplied by 10 or 12, life-cycle costs are more important than project construction costs. 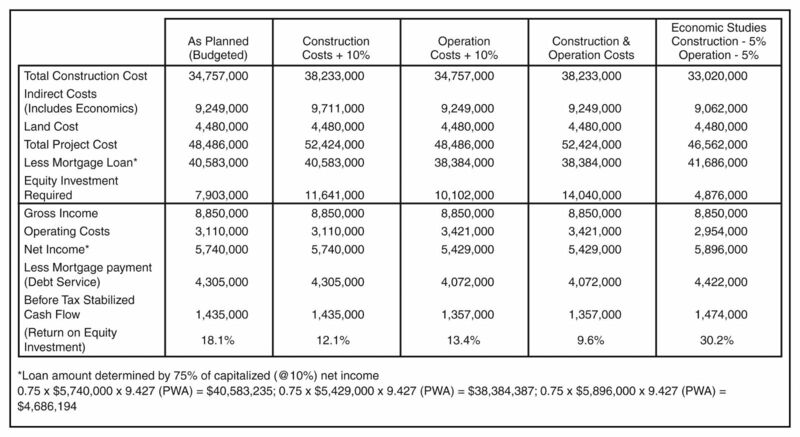 Figure 5 graphically illustrates the comparative costs associated with each building system. This helps to identify the areas that are high in cost and the systems where continuing costs are a major portion of the life-cycle cost. As shown in Figure 6, life-cycle costs are evaluated in tabular form, including initial costs, replacement and salvage costs, and annual costs in present value. This procedure provides a comparative analysis between alternatives to the original system design. Figure 6 illustrates the life-cycle cost of an HVAC system. The initial costs are made up of the equipment, related electrical cost, and owner-supplied equipment. 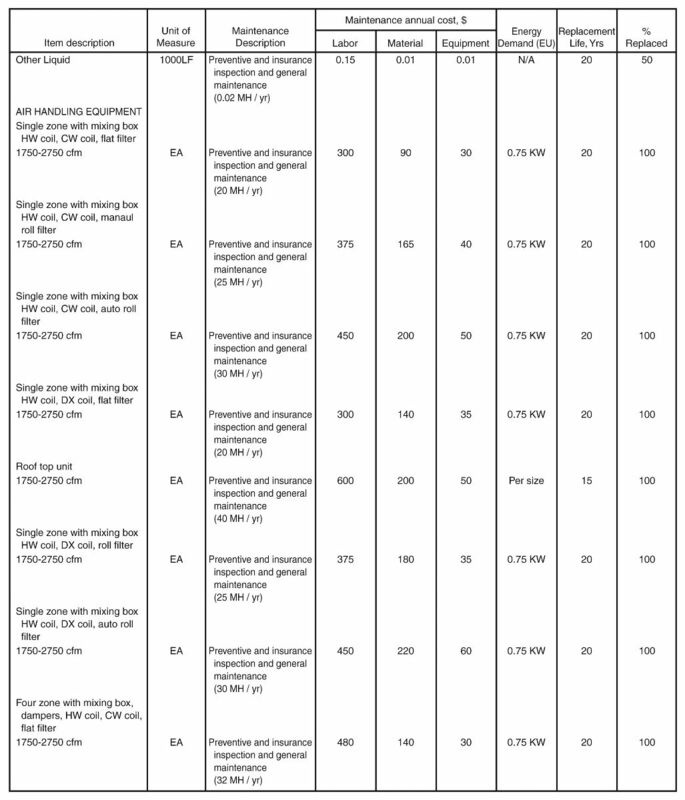 The salvage and replacement costs show the equipment replacement cost required by each alternative and the salvage value for each. The annual cost portion of the life-cycle cost includes maintenance and operation costs for each alternative. Other annual costs include licenses, permits, and insurance. All these costs are then added for a total life-cycle cost for each alternative. Present and future costs are brought to a common point in time. Two methods are used in life-cycle cost. 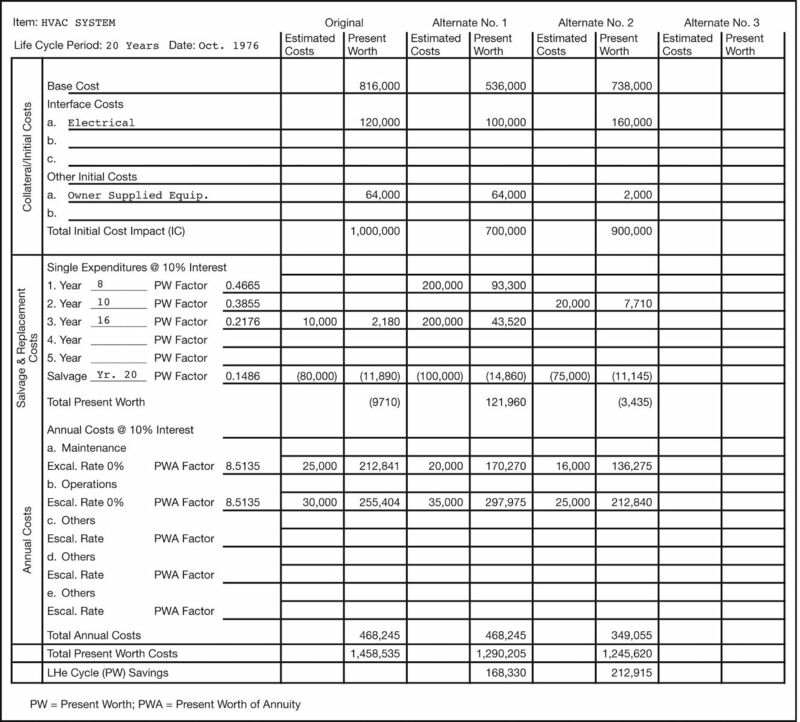 Costs are converted to current cost (present worth or net present value) or converted to annual payments (annualized). Either method makes it possible to compare the economics of alternatives. Life Cycle Costing for Design Professionals, by Alphonse Dell'Isola and Stephen Kirk, is an excellent source for life-cycle cost economic methodology. For a discussion of Net Present Value (NPV), see the chapter in Part 1 on financial analysis. In value decisions, however, one common mistake in using NPV is using incremental, marginal NPV results to determine whether it is appropriate to make a marginal investment in the next level of a mutually exclusive alternative. In some circumstances, the resulting NPV calculation can tempt the evaluator to prematurely halt their effort and not fully explore the NPV relationship with the base alternative and a seemingly more expensive alternative. When an investment decision is mutually exclusive, it means that you forego one or more choices if you select another. For example, selecting one specific type of roof is a decision that is fundamentally independent of the type of window that you might select, and therefore the choices surrounding these two independent building systems are not mutually exclusive. However, a choice related to the thickness (or R-value) of insulation (1 inch, 2 inches, or 3 inches) on the roof is an example of a mutually exclusive choice. If you select 1-inch insulation, you have foregone a decision on 2- or 3-inch insulation. The problem with using only the NPV calculation to decide which is the best insulation thickness (or on any mutually exclusive decision) is that the “marginal” present value does not always lead to the best answer. Going back to the roof insulation example, the marginal NPV improvement of going from 1- to 2-inch insulation may dictate going ahead and designing the roof system for 2-inch insulation without any further examination. This is because the labor cost to install the insulation is about the same for any thickness, but the gain in energy efficiency is far greater than the added costs of the materials. If you then check to see whether it makes sense to go from 2 inches to 3 inches using NPV, you may find that it is not a good decision when, in reality, the NPV of going directly from 1 inch to 3 inches has the best NPV. Thus, on mutually exclusive choices, it is always important to calculate NPV against the original choice, not against other mutually exclusive choices. Review of any design by a construction contractor can add innumerable benefits to any building project. The constructability of a particular design will have a profound impact on the cost and the time required to build the facility. Evaluation of the proposed building systems can be a valuable contribution during the design process. However, the experience and expertise of contractors will determine the actual value of their review. The review should occur early in the design to provide the greatest benefit, and making it a part of the value management process will yield the greatest results. If it is a part of the value engineering study, project issues related to ease of construction would be evaluated along with other affected disciplines. Some common project delivery approaches, such as Construction Management and Integrated Project Delivery, encourage this type of early involvement by the contractor as a natural by-product of their processes and are used as one of the cornerstones for their use. Some government agencies that must operate in a publicly competitive bid environment include in their construction contracts a prescribed procedure for providing savings during construction. This process is sometimes called a value engineering change proposal and as described in chapter six of the Value Engineering Program Guide for Design and Construction. It gives the contractor on public works projects the opportunity to offer alternatives for better value that will produce savings in project cost. This opportunity is important because many public works projects prohibit contractors from working with the agency before the award of the bids for technical and professional advice. This approach often includes an incentive for the contractor by sharing the savings with the owner. Although this alternative approach provides opportunities to engage in the value management process in a public environment, this type of review is most successful when the contractor is a member of the team from the start of the project. 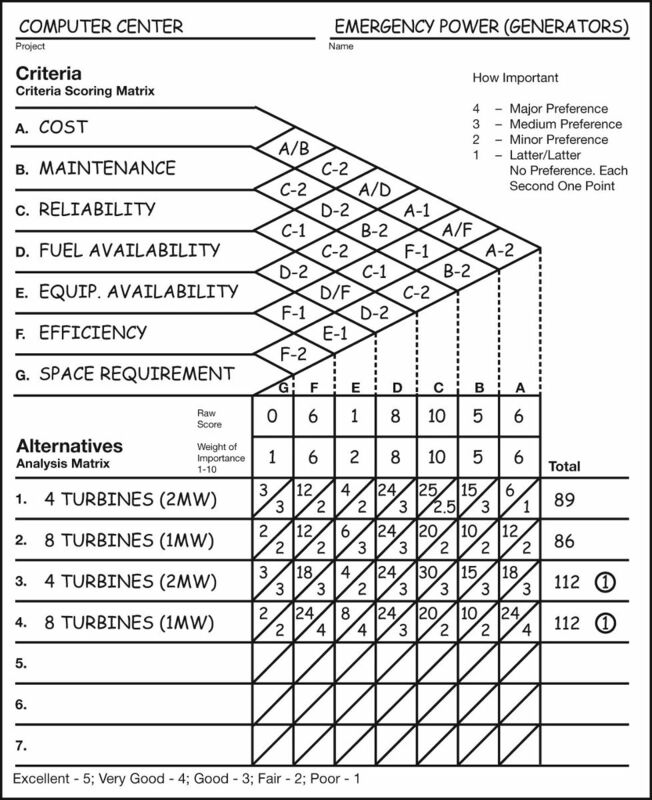 Maintenance information can be found in various forms, but one source has compiled the information in a format for use with value engineering and life-cycle cost forms. A sample of this information is illustrated in Figures 7 and 8. The form is organized in seven categories: structural, architectural, mechanical, electrical, equipment, site, and other. Each element is identified by its UniFormat code number. Data are provided for annual maintenance cost (labor, material equipment), energy demand, replacement life in years, and percentage replaced. Source: Alphonse, J., and Stephen J. Kirk. Life Cycle Cost Data. New York: McGraw-Hill, 1983. These forms identify unit of measure of maintenance and describe the maintenance performed. The institution's historical information could be substituted for the data. This information typically is included in life-cycle cost evaluations as a part of the value engineering project study. Therefore, if value engineering is included in the design process, the statement is made as a part of the proposed alternatives. To receive the best value in the design process, institutions should incorporate the proven methodologies of value management through appropriate value engineering principles and life-cycle costing as a part of the early phases of design. The issues related to the maintenance and operation of facilities must be part of the overall cost considerations and a necessary part of the program requirements to ensure its consideration in the design process. The minor additional expense will be returned many times in the economics of the total cost of ownership. An economic survey of a typical office building illustrated in Figure 9 shows the dramatic results of a small reduction in the construction cost and operation cost over the life of the project. The return on investment in this example increased from 18.1 percent to 30.2 percent. Source: The Smith Group Building Cost Index. 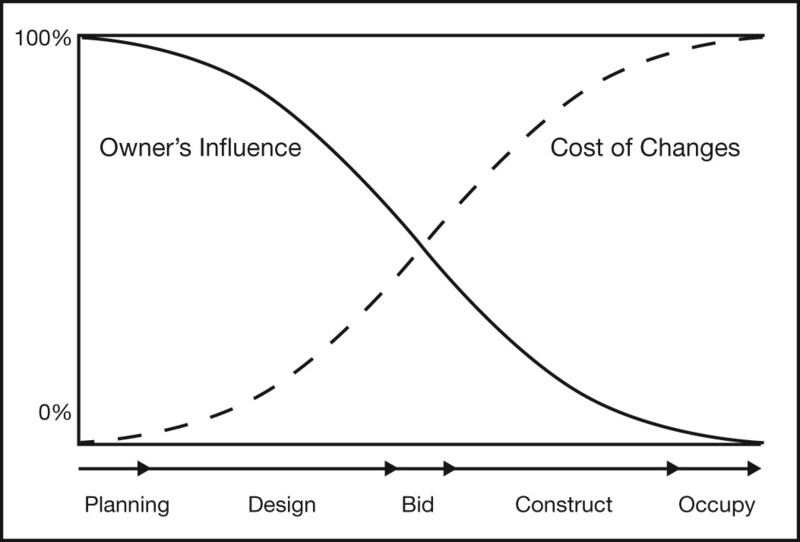 "Economics to Optimize ROI during Project Design." Fourth Quarter. 1983. Dell'Isola, Alphonse, and Stephen J. Kirk. 1981. Life Cycle Costing for Design Professionals. New York: McGraw-Hill. This book describes procedures for the designer to use in evaluating various energy and other life-cycle ideas with respect to economics and other noneconomic criteria. It leads the designer through each step of the analysis. Dell'Isola, Alphonse J. 1988. Value Engineering in the Construction Industry. 3rd ed. New York: Van Nostrand Reinhold. This third edition demonstrates how to use advanced value engineering techniques to isolate, control, and reduce costs on all aspects of design and construction. Kirk, Stephen J., and Kent F. Spreckelmeyer. 1993. Enhancing Value in Design Decisions. New York: Van Nostrand Reinhold. This book provides the design professional with a systematized framework that will enhance decision-making skills. The process in this book addresses a wide range of design concerns, including cost, energy use, aesthetics, and behavioral factors, while considering the viewpoints of owners, users, builders, building managers, and the community. The Smith Group Building Cost Index. "Economics to Optimize ROI During Project Design." Fourth Quarter. Washington DC, 1983. 1. Dell'lsola, Alphonse J. 1988.Value Engineering in the Construction Industry. 3rd ed. New York: Van Nostrand Reinhold. The third edition demonstrates how to use advanced value engineering techniques to isolate, control, and reduce costs on all aspects of design and construction. 2. The Center for Facilities Research (CFaR) was established in 2002 by APPA to organize and consolidate research in facilities management issues.